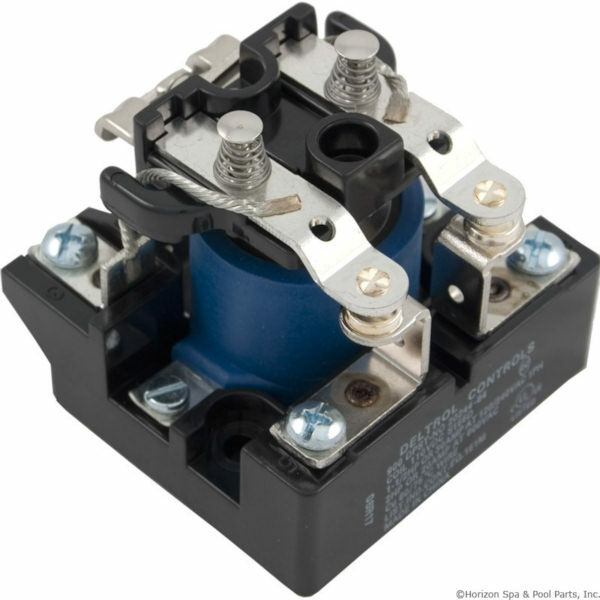 These switches are commonly used to provide power to the heater element; however, there are many other applications. Pay particular attention to the coil voltage, number of wires coming in and out, and amperage required when selecting a contactor. These values are almost always on a label on the side of the contactor. The connections on the ends are usually a combination of screw-down and spade connectors; these are the power-in and power-out connections. The spade terminals on the sides are for the coil, which is what pulls the points down to complete the circuit. If you have correct voltage at the coil and the switch is not closed, it most likely means the contactor needs to be replaced. SP (Single Pole) = One wire in and one wire out on the large screw connectors. May have additional wires on spade connectors. Coil connectors are on the sides. DP (Double Pole) = Two wires in and two wires out on the large screw connectors. May have additional wires on spade connectors. Coil connectors are on the sides.